A violent riot broke out during an Eritrean Cycle Festival last week in Greater Manchester. Police have condemned the "appalling" violence at a cycling festival in Greater Manchester that saw nine people hurt and eight men arrested. Thirty protesters stormed the Eritrean event at Curzon Ashton's Tameside Stadium on Saturday, throwing bottles, food and beer kegs. Organisers said frightened young children were put in danger by the violence. It is thought the men were protesting against the Eritrean government. [...]"It was a peaceful protest at first and then they barged in throwing bottles, food and beer kegs. "It was outrageous - there were children in buggies and people cut and bleeding. "This was supposed to be a festival but now we leave with a sad feeling. "Young children were put in danger by these cowards." 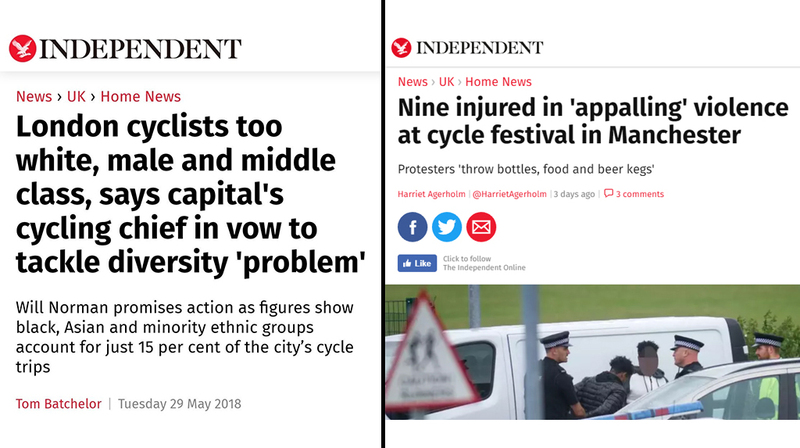 "The UK's cyclists are too white, male and middle class!" they said. "Cycling desperately needs more diversity!" they said.